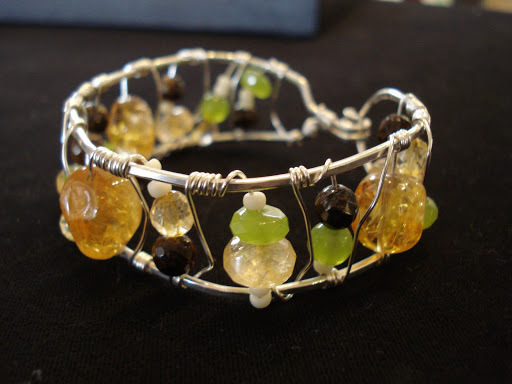 I was browsing the internet looking for new ideas for classes and I kept seeing different versions of the wire cuff that looked fairly simple to create, but were still very beautiful and funky. 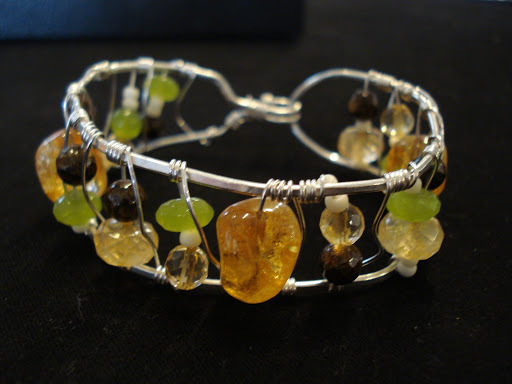 I would like to offer another wire cuff bracelet class (maybe call it “Freestyle Wiring”) in our stores. It took me about 30 minutes to complete and I’ve gotten multiple compliments on it when I wear it, so I think it would be a great addition to our class listing. 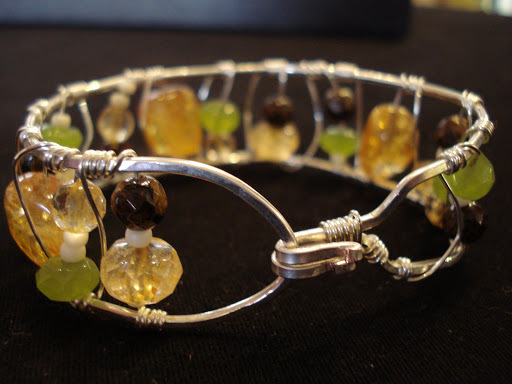 I made this one with 16 and 22-gauge silver plated wire, citrine nuggets and rondelles, green and brown agate rounds and some size 8 seed beads. I call it “Orange Tree Inspiration”! So since I was feeling overly accomplished and proud of my new piece of jewelry, I ventured to take on a wrapped-wire coin pearl pendant I saw in the latest Art Jewelrymagazine. I don’t think it turned out too badly! This one took me about an hour (I was forced to redo the inside section twice -kind of tricky!). I would have had an easier time using Sterling wire (I used silver plated copper) but I never like to use sterling on a project until I work out the kinks in case I have to start over.